Med hjælp fra elite udholdenhedsløbere har vi hos TPW™ udviklet et sortiment af produkter, som er specifikt beregnet til at øge din udholdenhed og præstation. Da vi ved, at udholdenhedstræning og konkurrencesport opfattes som de mest krævende sportsgrene for hjerte og kredsløb og kroppens aerobe system, har vi fundet to forskellige kulhydratformer, du har brug for til carb-loading, samt videnskabeligt underbyggede aminosyrer, som har vist sig at hjælpe med at forbedre sportsudøveres udholdenhedsevne. Undersøgelser viser, at udholdenhedsatleter kræver flere kulhydrater end andre typer atleter. Det skyldes, at kulhydrater som bekendt er kroppens primære brændstofkilde. Derfor har vi fundet forskellige kulhydrater: Fra langsomt virkende, med lavt glykemisk indeks, som forsyner dig med langsomt frigivende energi. Til hurtigtvirkende kulhydrater med højt glykemisk indeks, som giver et hurtigt energiboost. Og for at fremme restitueringen efter hård udholdenhedstræning, har vi også udviklet et sortiment af proteinshakes. Forskning på McMaster University i Ontario, Canada har vist, at udholdenhedsatleter har brug for lige så meget protein som styrkebaserede atleter for at modvirke overtræning. Baseret herpå har vores formler med protein og kulhydrat i det rigtige forhold vist sig at give optimal restituering. Og endelig er vi hos THE PROTEIN WORKS™klar over, at ernæringen på eliteniveau kan være den afgørende faktor for at vinde eller tabe. Derfor arbejder vi intenst på at tilbyde dig de bedste tilskud til udholdenhedstræning på markedet og anvender kun de ypperste ingredienser. Det er en integreret del af vores løfte om kun at tilbyde REN sportsernæring. I sidste ende betyder det, at alle sportsudøvere, som bruger TPW™-tilskud, kan være sikre på, at ingredienserne er 100 % nødvendige for kroppen, og at de ikke indeholder nogen kunstige søgestoffer, fortykningsmidler eller fyldstoffer. Get ready to experience a nut butter fest like no other. Whether you’re spreading, stacking or straight up snacking, you need Loaded Nuts™ in your life. It’s pure indulgence without the guilt. Rich in protein, palm oil FREE and high in healthy fats, it is nutritionally on the money. Each creation in this range is totally unique, combining tempting naughty chunks with taste bud bursting flavours. We dare you to only take one spoonful - in fact, we double dare you! Raze-Burn™ is the culmination of well over a year of planning, having received 1000s of requests for a thermogenic pre-workout, we couldn’t let you folks down could we? So we took one of our bestselling pre-workouts and rebuilt it into a true innovation, deserving of the TPW™ official seal of approval. Raze-Burn™ delivers on two fronts; explosive energy followed by a team of nutritional heroes: Green Tea Extract, Conjugated Linoleic Acid, Caffeine and L-Tyrosine. These potent ingredients all combine to help you maximize your body composition goals. Finally, this ground-breaking formula is enriched with our unique Vitamin & Mineral Blend and Flavour Boost™ technology. Performance Caffeine provides the ever popular preworkout caffeine in a convenient tablet format. Caffeine is one of the world’s most well researched ingredients in the history of sports nutrition and has long been used by athletes as a preworkout booster. Genesis Pre Workout™ is a high potency formula that challenges current pre workout sports nutrition boundaries and thinking. The formula is based solely on cutting-edge ingredients and incorporates the very latest manufacturing techniques. Pre-Works™ represents a new zenith in preworkout science, incorporating in excess of a staggering 27g of active ingredients per serving. A scientifically driven ground-breaking formulation, it is designed for anyone looking to supercharge their workout and achieve optimal results. It is densely packed with over 20 of the most researched single extract ingredients on the market today and comes in a range of insane tasting flavours. It is a favourite at TPW™ Towers for anyone in need of a serious boost. 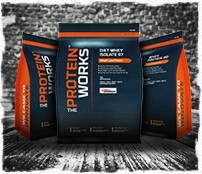 All in One Protein The Works™ is a cutting-edge, all in one protein formula designed to aid muscle building. It boasts a blend of premium grade whey protein concentrate and whey protein isolate, optimal dosages of creatine, leucine and a 'TPW™ Dual Phase Carb System'. Whey Protein 360 is a premium protein shake that breaks new ground in protein formulation and flavour. It has been specifically designed to work with almost any fitness or body goal as its high in protein and low in sugar. Whey Protein 360 is ultra pure, natural and made with the very finest protein sources. Looking for more? Then check out our Whey Protein 360 Extreme, our most innovative protein shake to date! Whey Protein 80 is our award-winning whey protein concentrate. Winner of the highly coveted “Best Protein Award" in the FSN Product Awards, TPW™ whey protein is available in a wide range of exclusive flavours and is known for its exceptional purity. For best results, we recommend coupling your Whey Protein 80 with BCAA or Creatine Monohydrate!